Isn’t it really just learning by another name? We hear a lot about knowledge building in education circles these days! What is it anyway? 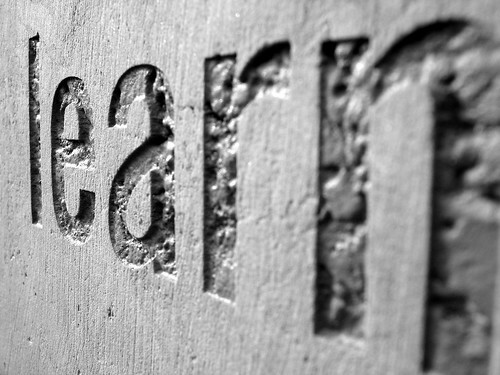 Why don’t we just call it learning? Where did this term knowledge building come from? When I first started speaking of knowledge building (KB), people looked at me as if I had two heads! People thought the term to be officious and puffed-up. But, now—now it’s ever-so-cool. Everyone is using it—but, perhaps without any deep understanding of its roots, its meaning—beyond that of learning. In fairness, this is actually a fairly common phenomenon as new concepts and words come into our everyday lexicon. It is known as lexical or semantic drift. Meanings change from the original intent. So it is with knowledge building. 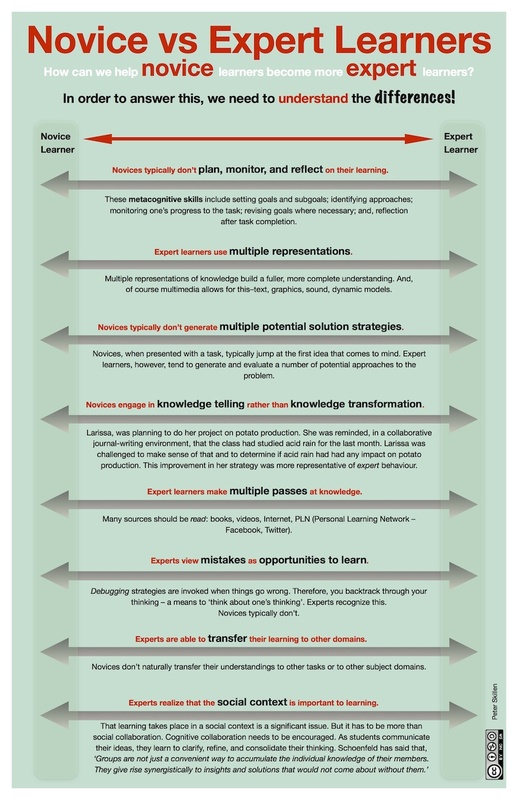 This graphic (courtesy of IKIT) delineates the conceptual differences between learning and knowledge building. What does a Knowledge Building classroom look like? The origins of knowledge building in education arise out of the work of Marlene Scardamalia and Carl Bereiter at OISE/UT. Their work in knowledge transforming and intentional learning—as it relates to the development of expertise—has been the foundation of their coining the term knowledge building. This work goes back to the mid 1970s and their development of CSILE—Computer Supported Intentional Learning Environments in the mid 80s. Intentionality. Most of learning is unconscious, and a constructivist view of learning does not alter this fact. However, people engaged in Knowledge Building know they are doing it and advances are purposeful. Community & knowledge. Learning is a personal matter, but Knowledge Building is done for the benefit of the community. In other words, students engaged in knowledge building are intentional about their learning—they treat knowledge as an entity that is discussable. It is something about which they reflect and build upon. Also, students can be said not just to be in charge of their own learning, but also have responsibility for the learning of the group. I describe here a situation where true collaboration occurred between two students (visible to all students) in which the questioning by one student (Heather) led the other (Larissa) to rethink and to rework her driving question for her project on potato production in Prince Edward Island. She needed to do more than knowledge telling. She was required to build new schema by a deeper transformation of the information at hand. Higher levels of agency. Students take responsibility not only for meeting learning objectives set by the teacher but for managing the long term acquisition of knowledge and competencies. Existing classroom communication patterns and practices as obstacles to intentional cognition. Even though teachers may try to encourage inquiry and independent learning and thinking, common characteristics of the classroom environment militate against it and instead increase dependence on the teacher (Scardamalia & Bereiter, 1996). It was during this time that CSILE was developed. Originally, it was a text-based system and I, personally, was challenged by a text only environment—as I was a recent HyperCard enthusiast and enjoyed, and saw cognitive benefits for, graphical interfaces and hypermedia. As part of the CSILE team, I made a case for multiple representations of knowledge—beyond text only. This was a time rich in studying expertise, the differences between expert and novice behaviour and, indeed, how one encourages and supports the development of expert learners—both face to face and in online spaces. Protocols and procedural facilitations were developed to scaffold the execution of higher level strategies by students. It was recognized, as we hear so much now, that teachers may indeed be a bottleneck in the advancement of knowledge creation by students. However, it’s not merely about student agency—that is necessary, but not sufficient. Students must learn the skills, develop the attitudes and build/participate in the community. As the research into intentional learning developed, the researchers noticed something else happening in the CSILE classrooms that involved all the students. They noticed that the kids became really involved in contributing to the knowledge problems that arose. In fact, to be part of the classroom community, you really needed to contribute. So it seemed that a great motivator and sustainer of intentional learning behaviour was ‘the simple and virtually universal desire to belong’. 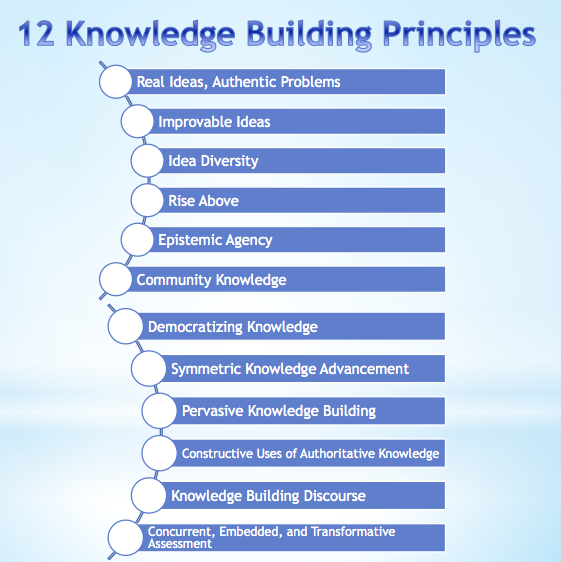 Twelve knowledge building principles have been articulated. I will mention them here, but I suggest you read the complete descriptions or watch these videos because the headings won’t tell you too much! 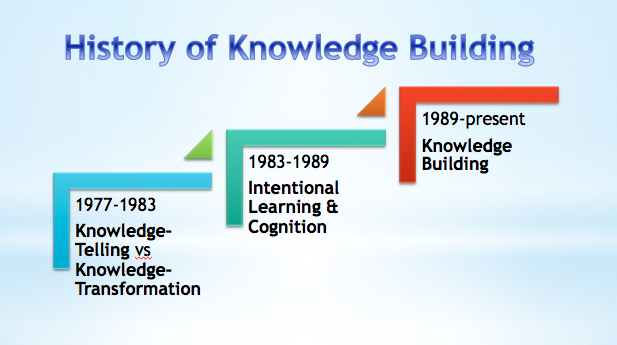 I include them in this graphic to illustrate the depth and complexity of the term knowledge building. Knowledge Forum evolved out of CSILE and is available to support you in developing knowledge building classrooms. One cannot equate learning with knowledge building. The terms are not interchangeable and I believe we need to be careful when we appropriate language and use it casually. I have the same concern with other current, common constructs such as inquiry, collaboration, and project-based learning. I am absolutely certain that I do the same thing with many expressions and terms where that domain is not my area of expertise! Please be patient with me when I do so, but please also gently point me to resources that will deepen my understandings. Given the topic of this post, I will now ask you to do a little reflection on the ideas presented here, on your previous and current thoughts about learning versus knowledge building, on your own practice, and on the dominant classroom and school culture in relation to these ideas. What might change for your practice? What steps might you take to move forward? What confusions/questions do you have? I encourage you to do this publicly—here or in another online space where we might further our collective understandings. A Brief History of Knowledge Building: A Brief History of Knowledge Building is a great place to start reading about knowledge building. Knowledge Building: Scardamalia, M., & Bereiter, C. (2003). Knowledge Building. In Encyclopedia of Education. (2nd ed., pp. 1370-1373). New York: Macmillan Reference, USA. Professional Development: Knowledge Building: The Professional Development: Knowledge Building site is a superb site developed by the OISE originators. Find out what a knowledge building classroom looks like, how to get started, assessment strategies, etc. Knowledge Forum: Knowledge Forum is available for purchase and implementation in your school or classroom. Natural Curiosity: Natural Curiosity is a resource that has been developed for teachers. There are wonderful classroom videos online describing ideas about developing a knowledge building culture and knowledge building discourse among students. You can also download a Natural Curiosity handbook. Learn Teach Lead: LearnTeachLead, of the Ontario Ministry’s Student Achievement Division, has produced and posted some excellent videos including interviews with Marlene Scardamalia. Visible Thinking: I would also recommend the book, Visible Thinking, by Harvard’s Project Zero group. The Visible Thinking website also has some worthwhile resources. ThinkingLand: In the mid 80s, as a graduate student in the CSILE group, I developed a networked version of HyperCard called ThinkingLand. It was based on the metaphor of a journal and so could be considered as an online, collaborative, and scaffolded journal writing environment. It was implemented in a sixth grade classroom for research purposes. 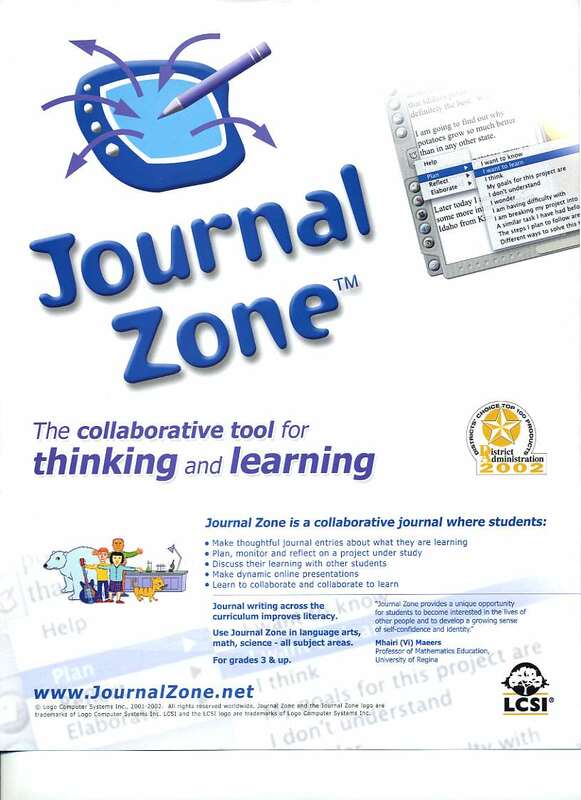 Journal Zone: In 2000, LCSI (of Logo fame!) contracted me to lead the design of Journal Zone—which was based on ThinkingLand. It was an awesome online environment, but was not commercially successfully as it launched just at the same time as blogging arrived on the scene. People went blogging—without all the scaffolding and procedural facilitations we had built into Journal Zone. (It is no longer available.) See Using Visible Thinking Strategies to Develop Expert Learners for a description of the practical elements of Journal Zone which you can build into your classroom practice. 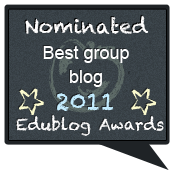 This entry was posted in Collaboration, Inquiry and tagged authentic learning, collaboration, inquiry, Inquiry Based Learning, pedagogy, project-based learning, Reflection, visible thinking. Bookmark the permalink. 3 Responses to Knowledge Building: What is it Really? I think that to actually foster better learning, we need to turn unconcious learning into a strongly conscious way of learning, which is to build up knowledge consciousnessly, whether personally or for a group. Of course, if one has the knowledge conciously built up, it is easy for him/her to share that knowledge with others and with community. Also knowledge building is more based on personal experiences and comprehension of those experiences, although reading of ideas from other people does play a role as well.